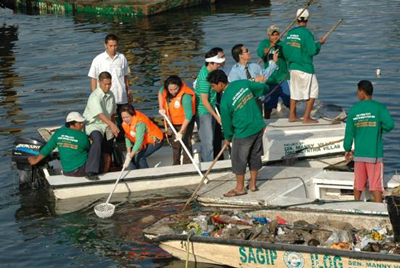 The Sagip Ilog (River rehabilitation) program was launched on December 13, 2002. Within the 56-kilometer stretch of Las Pinas-Zapote River System, 30 kilometers are being regularly cleaned. This involves daily collection of floating garbage, as well as the installation of steel garbage traps/wire mesh strainers in the Las Pinas and Zapote rivers to filter the waste/debris. From 2002 to 2005, 9,070 residents from various communities along the river system in Las Pinas City, Paranaque City and Bacoor, Cavite were trained on ecological solid waste and river management. Some of them were designated river watch volunteers. The local government officials and nearby communities actively participated in the information drive and capacity building activities. To date, there are 3,120 trained and active volunteers. The volunteers were organized into different river watch teams in the areas that border on the rivers. In 2001, the Coastal Environment Program of the Department of Environment and Natural Resources-National Capital Region (DENR-NCR) replanted bamboo species, locally known as kawayang tinik, to rehabilitate the Marikina and Las Pinas Rivers. These rivers which are both situated in Metro Manila are major contributors to the rapid environmental degradation of Manila Bay. Five kilometers of the said river system were targeted for re-greening using bamboos, mangroves and other related species for soil erosion control. To highlight this effort, two separate portions of the riverbanks were developed into “bambusetums”, planted with various species of endemic/exotic bamboos. As of August 2010, 10,000 bamboo culms are already planted on the riverbanks measuring 20 kilometers. Re-greening of the river banks minimized soil erosion that caused siltation of the river system. The propagation of culms from the 37 species of bamboos available in the area, have been sources of income through the harvesting of matured poles, sold to interested handicraft/furniture makers. This is aside from the jobs provided by the program to some 62 workers for the river dredging, clean-up, and re-greening activities. Composting or production of organic fertilizer from wet garbage. Each of the 20 barangays in Las Pinas City now has at least one composting facility. One rotary composter can process the wet garbage of around 500 families or households. Since July 2007, vermi-composting is now being done in two barangays. Producing 400 kilograms a week, each location sells their produce to farmers in a nearby province as alternative fishmeal aside from organic fertilizer. It helps reduce the amount of biodegradable waste and contributes to the promotion of organic farming. On August 12, 2010 a “re-cycling day” was launched in five barangays, engaging residents to sell their recyclables to junkshop owners. There is now a monthly “re-cycling day” in all 20 barangays of the city. Making of Christmas lanterns and other decorative items from bamboo, capiz shells and other materials that are endemic to the city; the parols (lanterns) make use of bamboo for frames. The supply of bamboo is assured by the thriving bamboo plantation along the river banks and some vacant lots in the city through the Bambusetum project and the Pagtatanim para sa Kinabukasan (“planting for the future”) program. 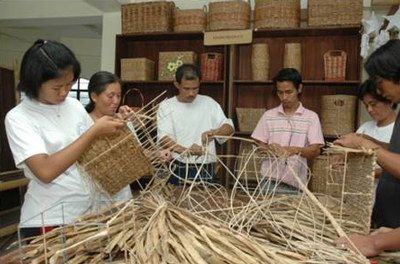 Weaving of baskets from water lilies that posed a problem to the river’s ecosystem and caused flooding in the city; water lily stalks are now used as the primary raw materials in the Las Pinas Basket Weaving Center. Started in October 2005, hundreds of families have benefited from the program from villages all over the country. Production of coco nets and coco peat from coconut husks that were just thrown into the river; a decorticating machine shreds the coconut husks leaving two distinct forms: a fiber used for manufacture of coco coir for slope protection and a granular form, a potting medium to enrich soil. The eThekwini Water and Sanitation Unit (EWS) has the responsibility of managing water and sanitation services within the eThekwini Municipality. In 1996 the boundaries of the municipality were extended to create a Metro, and then again in 2001 to become a Unicity, which resulted in an increase in the number of households with no access to water or sanitation being incorporated into the EWS service mandate. In addition, there has been a substantial influx of poor people from rural areas. This large rural-urban migration is expected to continue for decades and places further strain on the municipality to expand their services to these communities. Additionally, eThekwini, Durban, is a city of contrast with both first world infrastructure which requires constant maintenance and upkeep to ensure that supply is sustained, as well as third world conditions in informal and rural settlements where no supply exists. Innovative technical methods of service delivery had to therefore be introduced for sustainability, environmental, financial and water scarcity reasons, requiring customer acceptance, education and training. The established and well behaved customer base also needed to be retained and reassured that costs and quality of delivery would not be compromised. The EWS identified various levels of service that would allow provision of water and sanitation to all residents of the Unicity in the urban, peri-urban and rural areas. These included the installation of full pressure, semi pressure (roof tanks) and ground tanks for the provision of water, and the use of water borne sewerage systems, ventilated pit latrines, ablution blocks and urine diversion toilets for sanitation. It was important to ensure that the type of sanitation system used matched the type of water supply system. A free basic water supply of 9kl per month per household was also introduced. Challenges that EWS faced included blockages of pipes, misuse and wastage of water, vandalism, high levels of non-revenue water, difficulty in accessing remote areas and the presence of water borne diseases such as cholera. Many of these challenges were as a result of a lack of awareness and education, especially in those areas that had not previously had access to water or sanitation services, while others consumers had never had a voice with regard to any services and a significant constituency and therefore considered non-payment, passive protest and vandalism of infrastructure to be legitimate action. As a result, the EWS embarked on an extensive awareness and education programme incorporating a participatory approach to ensure a two-way communication system. This programme was initiated in 1997 and works alongside the service provision programme to ensure continuous interaction with the target communities, awareness and education in the proper use and management of the services, and to monitor the acceptance, problems and successes of the services delivered. The priorities for the education and awareness programme were set based on the MDG to supply water and sanitation to all citizens, and on the need for all South Africans to conserve and protect the limited water resources. These priorities included improving the understanding and acceptance of the water and sanitation systems, educating to reduce the consumption and wastage of water, and the creation of forums for interacting with the local communities to determine the effectiveness of the programmes. The target groups for the programme included poor (vulnerable) communities in both rural and peri-urban areas; women (as they typically manage the households on a day to day basis); children in peri-urban and rural schools and their educators; and vulnerable households in urban areas (child headed, pensioners, indigent ).